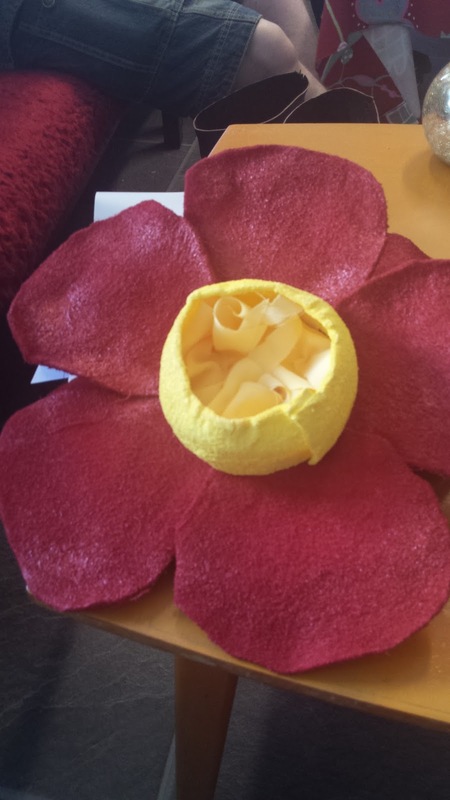 The next step that I finished for my Bellossom has been the hairflowers and shoes. The shoes were really simple. I found a pair of very cheap fabric shoes in cream with embossed flowers on them. 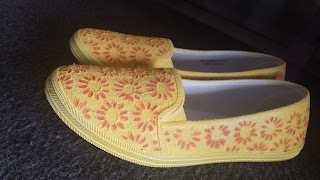 I simply spayed them with a layer of yellow paint and then I took a fabric marker and filled in all the flowers on the shoes. The hairflowers were a bit more complicated though. This was my first try of using a material called fosshape. It's a feltlike thermoplastic material. Meaning that it feels like fabric, but when you heat it up it becomes hard, it also shrinks and I found it a bit hard to predict how much it would shrink. It depended on the heat. 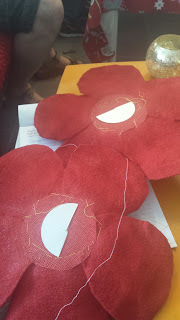 I started with cutting out five petals for each flower. I sewed the petals together and placed them over a deep plate to give them a bit more shape. 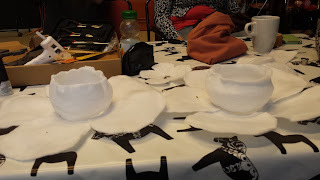 I used a heatgun on a low setting to shape the fosshape. 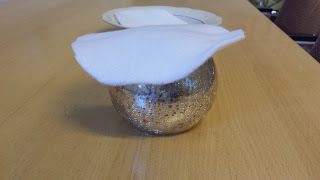 After a while I turned the flower and the deep plate and went over it so that both sides had hardened. 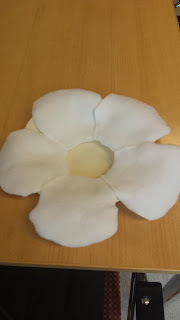 The flowers were harder, but still quite flimsy so I added a piece of buckram in the middle to give it a more stable centre part. I then tried to mold the centre pod of the flower over a light holder with but it didn't work. As you can see the fosshape started to curl upwards on its own, rather than downwards even if I tried to force it down. For the second attempt I instead made a cylinder of the fosshape and with the help of a plier I could get it to curl up around the light holder. 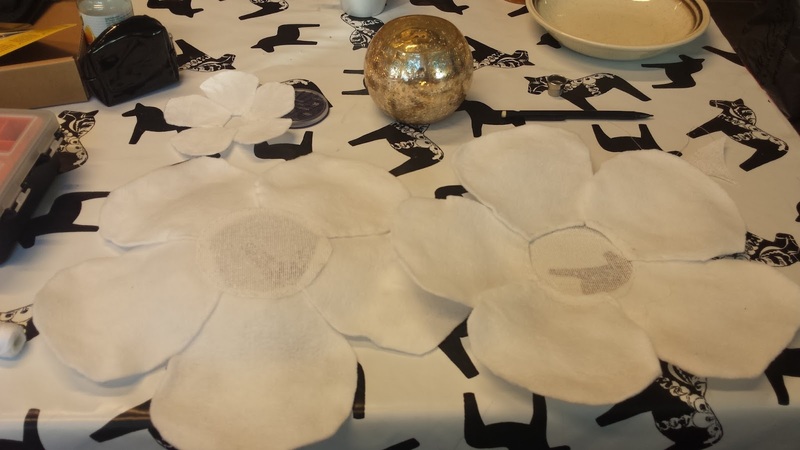 Here are the basic flowers, I'm really happy with the right one. 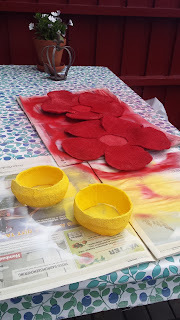 I then used spraypaint to paint the flowers, and finally I simply sewed the yellow centres to the base flower. 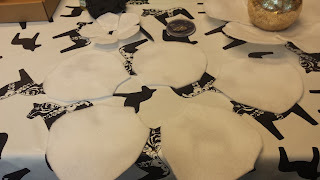 After having used fosshape I the best used for it is if you have a frame that you want to have covered, and that will be covered with yet material. 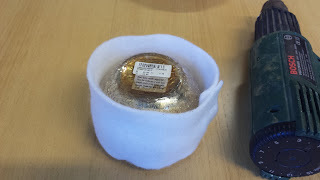 The surface of the fosshape, even after having been heated, was still quite fuzzy and felt-like. 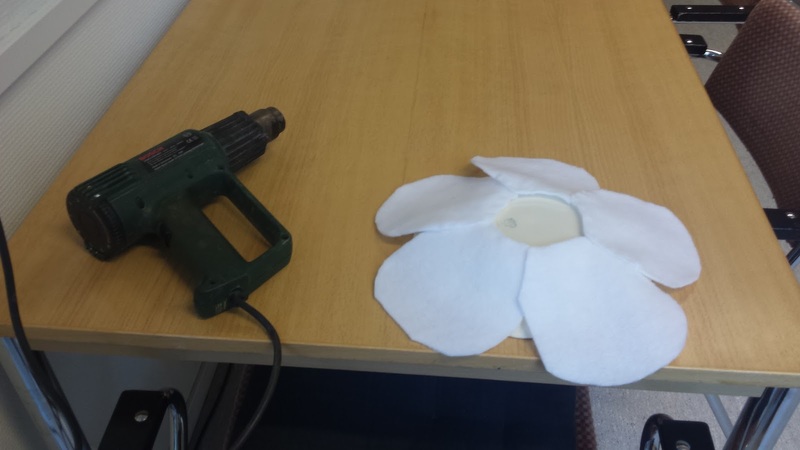 I did a test flower first where I used an iron to heat it, and then I could get a smoother surface, but I also got markes from the iron. It's very lightweight and there was no problem painting it, but I think it will be very hard to make it into a smooth and clean finish. Like other thermoplastics it sticks to itself when heated, but it doesn't melt into and bond together, and it was not enough to just have the stickyness to keep two pieces of fosshape together. 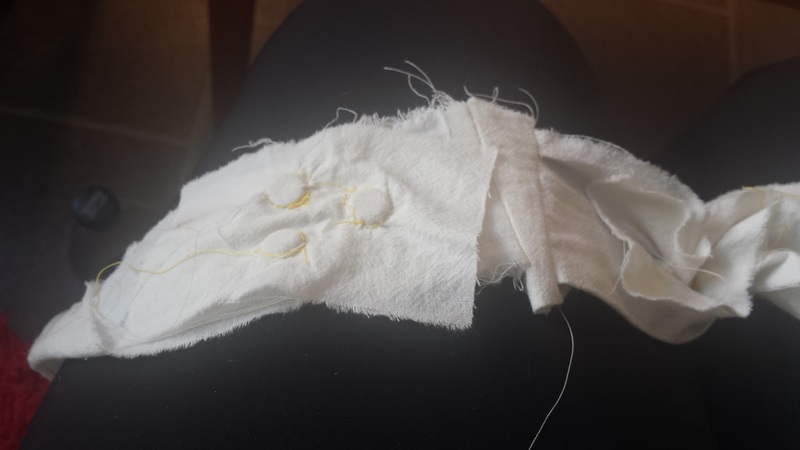 It's possible to sew through the fosshape after it's gotten hard, but use a very thin needle since the holes will be visible. I think the best way of using fosshape is as alighter version of buckram, and instead of using hot water you use a heatgun to shape it. 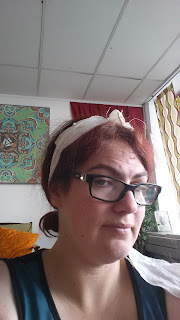 Then I needed to fasten the flowers to my head somehow. 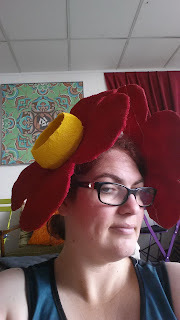 I wanted something that was adjustable and could be used both with a wig, or with a caul or piece of fabric covering the head. Now for NärCon I'm planning on using a green veil, but I also have a green wig for future use. My solution was to use magnets. I glued two flat pieces of magnetic metal to the underside of the flower. Then I sewed 2x3 small neodym magnets into a simple cotton headband. 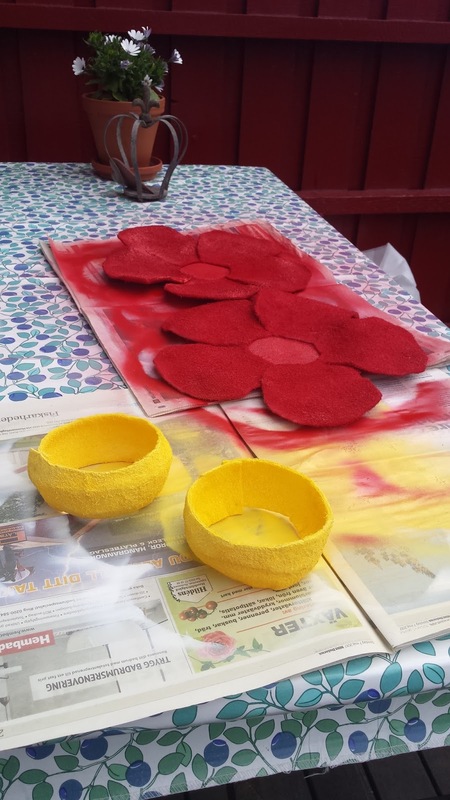 The flowers are held in Place by the magnets. The last thing I did with the flowers was to fill the centre with some scraps of chiffon to hide the red bottom and make it a bit more organic.